One of the TOP 5 reasons for Ergonomic Babywearing is INTERACTION. Ergonomic babywearing strengthens the attachment between you and your baby. This has results in growing an empathetic and secure child. It creates a harmonious and joyful interaction between you and your baby and helps the development of socio-emotional skills. 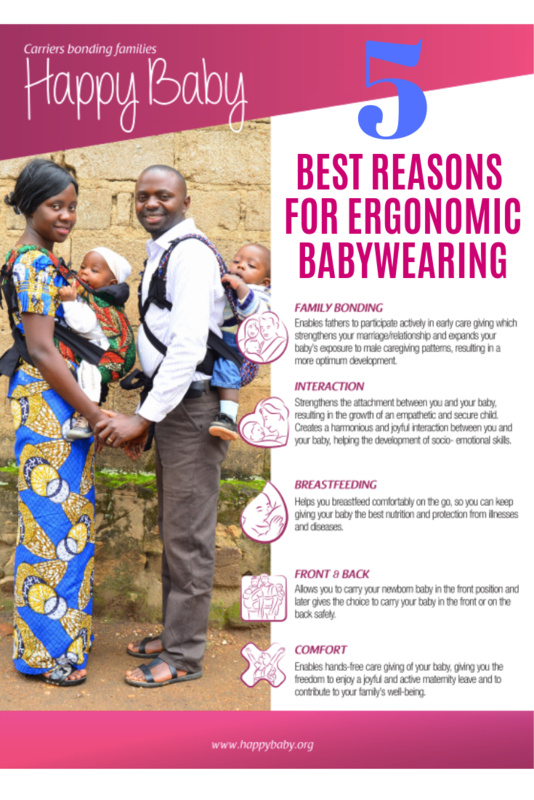 Another TOP 5 reasons for Ergonomic Babywearing is FAMILY BONDING. Ergonomic babywearing enables fathers to participate actively in early caregiving. This strengthens your marriage/relationship and expands your baby’s exposure to male caregiving patterns. This result is more optimum development. One of the TOP 5 reasons for Ergonomic Babywearing the versatility of FRONT & BACK carrying. Ergonomic babywearing gives you the option to carry your newborn in the front position, and later allows you the choice of using the front or back position. Also on our TOP 5 reasons for Ergonomic Babywearing is COMFORT. Ergonomic babywearing enables hands-free caregiving of your baby, resulting in the freedom of movement. You are free to enjoy a joyful and active maternity leave and to contribute to your family’s well-being. An important one of the TOP 5 Benefits of Ergonomic Babywearing is Breastfeeding. Ergonomic babywearing helps you breastfeed on the go. As a result, you can provide your baby with the best nutrition and protection from illness and diseases.